Missing Pieces in the second novel in the Cass Diamond series – Cass is a feisty, shrewd Indigenous cop with a black belt in Taekwondo. She often works ‘off the reservation’, piecing together seemingly unrelated information but also placing herself in danger. 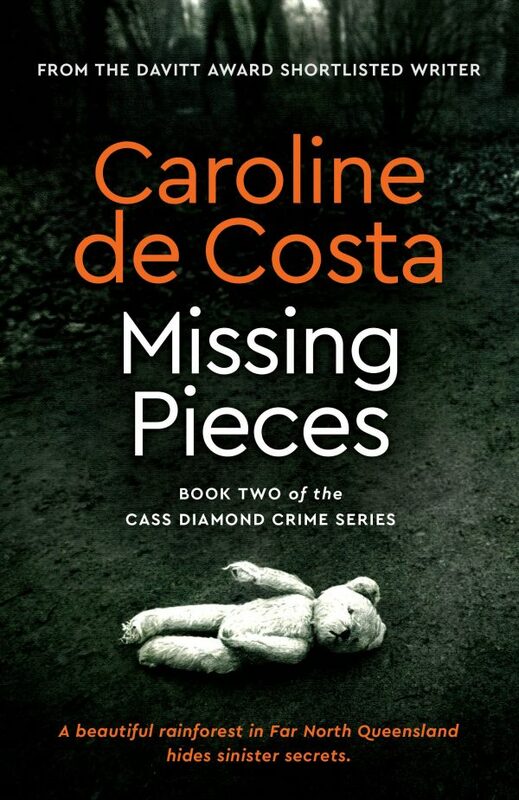 In the acknowledgements to Missing Pieces de Costa acknowledges ‘the many smart, beautiful kind and hardworking Aboriginal women I have had the pleasure and privilege of working with, teaching, and friendship with over the past thirty-eight years.’ It was fun spending time inside Cass’s head. I get the feeling she’s an amalgam of those women de Costa met through her obstetrics and gynaecology practice. I particularly warmed to de Costa’s non-judgmental attitude to her characters’ lives. She reveals their stories in detail – warts and all – but there’s a gracious, underlying understanding of their struggles and difficulties. Also sprinkled throughout the novel are Cass’s views on what it’s like to be a single mother and the politics of race. Environmental issues occasionally crop up throughout novel – the damage done by large-scale mining, loss of habitat and bleaching of the Great Barrier Reef (a not so veiled dig at Adani methinks). There are a few times when de Costa could have pulled back a little, however, these detours into social issues do not detract from the underlying mystery: is Yasmin Munoz alive. The cold case sub-plot of a missing woman Chloe Campion grabbed my interest and kept me wondering how the mysteries would tie in together. There are many interesting twists and turns in the story but, to me, occasionally de Costa reveals a little too much too early. But overall Missing Pieces is an engaging and intelligent book, sprinkled with authentic medical details that gives that extra lick of credibility to the story. Missing Pieces reveals Cairns in a riot of tropical heat, colour and vegetation – de Costa paints the landscape with an expert brush – the lush vegetation, brilliant flowers, the steamy heat, palm-ringed beaches, or the dry, water-parched Atherton Tableland. I would certainly recommend Missing Pieces for those with a social conscience and who also enjoy a police procedural in a truly delightful setting. The third book in the series Blood Sisters is due out in April.